Often times you find yourself getting invited or going to an ugly holiday sweater party. 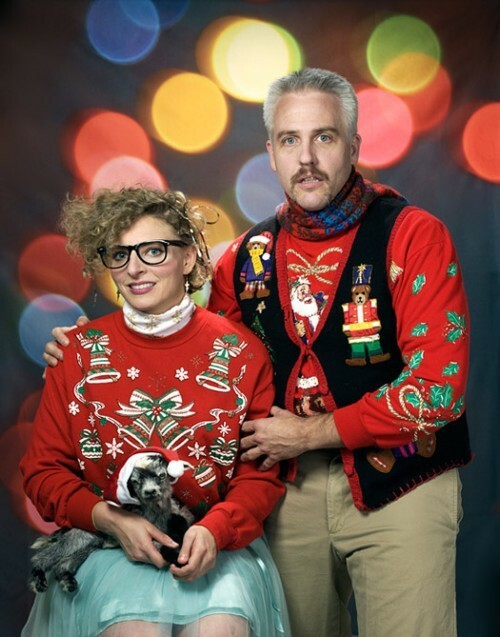 So, in these situations how can you make an ugly sweater into a cute look? Well, no fear I have put three looks together that will for sure help you out! 1. Pair it with jeans: If you want to keep your look casual, but cute, simply pair your sweater with a pair of skinnies, some flats, and a fun necklace. Also, you could tie a big holiday ribbon in your hair and use it as a headband. This look is ideal if it is more of a casual party with just a few friends. Or if you want to wear an ugly sweater to class one day. 2. Throw on some sequin shorts: Do you have some left over sequin shorts laying around from Halloween or a past party look? Pair it with your sweater! Wearing some sparkle with your sweater will make it seem a little more glamourous. Wear your shorts with a pair of tights and heels and you are ready for an ugly sweater celebration. This look is ideal if you are going to more of a party ugly sweater occasion. 3. Wear a green or red skirt: To make your look festive add some more holiday colors. If you have a red or green circle skirt wear it with your sweater. The added color will make your look seem even more crazy then before. Also, wear a pair of glitter shoes of some sort. Weather it be glitter Toms, flats, or heels this will add an extra level of holiday cheer to your look. So you don't have a Christmas sweater? No worries! Here are some some-what ugly but cute sweaters I found. You can ask Santa for them!